Blending up healthy protein shakes at home can be quick and easy with the help of a quality blender. In this guide we review the top brands and models that help keep you on pace with your fitness, health and weight goals. Personal blenders bring convenience and ease for smaller serving sizes at a more affordable cost. However, heftier blenders made to handle ice and coarse ingredients usually make a better job at creating a smooth texture are more durable - though at a higher price tag. Check out this roundup review of personal blenders, including those which handle ice, to choose the one that is perfect for your needs. Why protein shakes are so important? What to look for in a protein shake maker? Will these immersion blenders handle ice? Protein. An essential part of the structural components of your body - a “macronutrient” as it’s called. What does this mean? Protein is a building block of your body. This vital amino acid breaks down in the body and fuels your muscles. Sounds useful. But… what does this mean to YOU? Help in wound recovery including muscle injury and surgical trauma to get you moving and back to your goals quickly. The reason we’re focused on protein drinks here, is that they offer an efficient way to make sure you are getting adequate amounts of this important substance daily. Wow! That’s a lot of benefits from one daily drink! Yet, many believe it's too difficult or time consuming to make a proper healthy protein beverage, and settle for just mixing some protein powder with water or milk. The great news is, if you know what to do, you're just three minutes away from a delicious dessert-like beverage, healthy and nutrient-rich. With a quality machine and a few simple ingredients, you are speedily on your way to achieving your nutritional and fitness goals - with a lot of style and fun! Before deciding which is the right blender model for you, ask yourself what kind of protein smoothies are you looking to make? 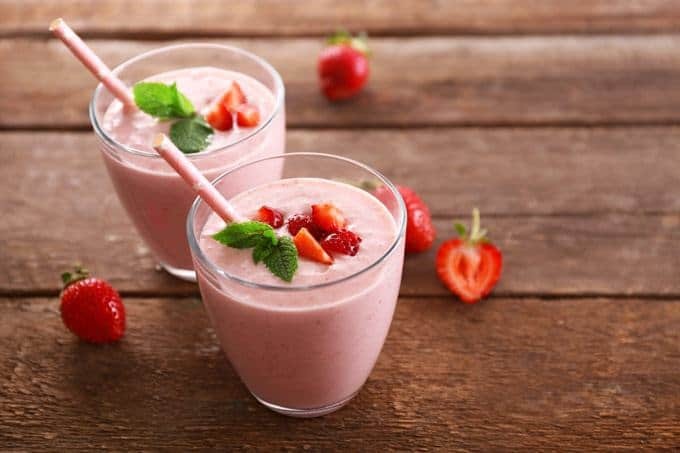 Would you use anything other than liquid, protein powder and maybe a soft fruit like banana or watermelon? If that’s all you need, then a personal hand blender would be perfect. These come with relatively low-powered motors, around 150-300 watts. For blending tougher ingredients and ice, you’d need more than 300 watts. This also depends on the blade design, since some of the models we reviewed here can handle ice even with only modest power. If you prefer your smoothies or shakes chilled, then an appliance designed to handle ice and other frozen ingredients is a must. That’s the reason we divided this review into two sections - one for those that can crush it, and the other - for the less ice-savvy. If you think that we’d recommend buying the machine that offer the most accessories - well, not at all. Any additional parts that you don’t really need, end up taking valuable kitchen space and cluttering your storage areas. Having said that, we’ve found to-go cups to be extremely helpful additions, as it means less cleaning and being able to easily take the shake with you to where you exercise. If you’re looking to make protein drinks for yourself or for up to two people, then personal blenders are the way to go. They’re easier to clean and store, while some even feature a to go cup. This means you can blend and then directly drink from the blending cup, or take it with you if you’re on the go. If you’re looking to make more than two servings each time, then a countertop or high performance blender could be more efficient. A protein drink maker can be dull and boring, or it can be this cool device you’re always looking forward to using again, before or after workout. So, the design does count, and as you’ll see in our reviews here, there are a couple of personal shake blenders that stand out. Whether you are looking to gain or lose weight, build muscle more efficiently or just boost your immunities, whipping up a protein shake makes the process simple. And, a personal blender becomes your ally in keeping your goals on track. But, as you tackle this healthy lifestyle, the blender options swimming across a Web search are likely to slow your progress. 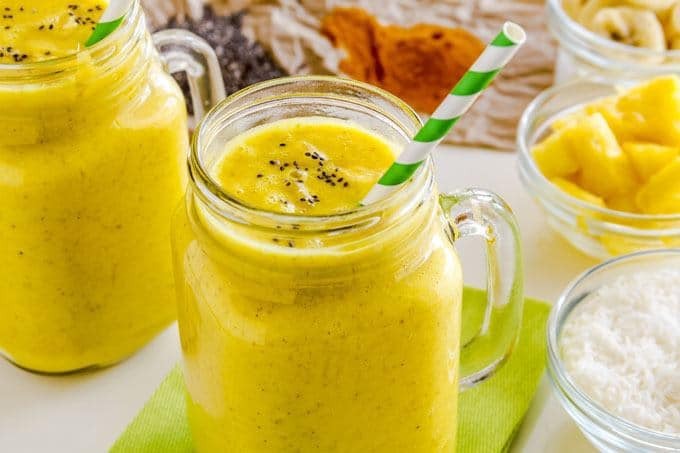 Review our pros and cons and top picks in the personal blender category below and blend up the following recipe the same day. Boasting almost 30 grams of protein without the use of protein powder, this shake benefits your body in more ways than one. Beginning with the water, add all ingredients to your personal blender and blend until smooth. In short order, you will be dashing off to your next activity, muscles fueled. Before getting to the blender reviews, take a quick look at the pros and cons of choosing personal blenders to meet your needs, over the more expensive ice-crushing blenders. Easy to clean in the dishwasher. Less power to handle coarse ingredients and ice. Tend to be messy to use. We chose the best models of hand (immersion) blenders according to our experience as well as based on our research of user reviews. 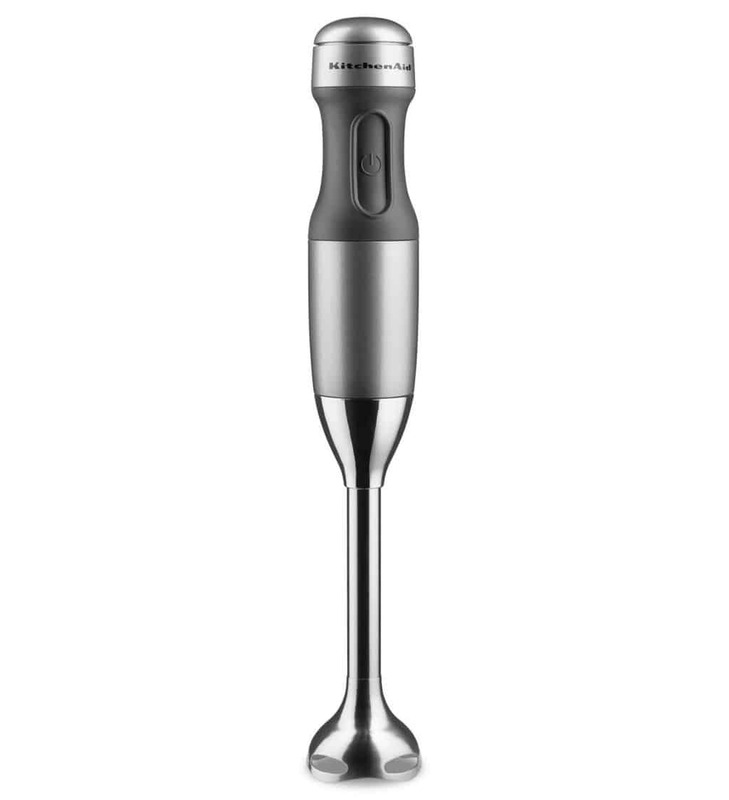 Breville offers convenience and blending control in the unique design of this immersion blender. We found the design to be innovative, but it isn't just for the sake of being a pretty appliance - operating it is very convenient due to the ergonomic features, and as far as making shakes and smoothies it's top notch. We especially liked its ice-crushing abilities and versatility. Read on to know why we gave it a solid rating of 5 stars. With a 280-watt motor, the Breville Immersion Blender gets the job done when it comes to evenly blending shake ingredients and more. This quality, durable product handles ice and other tough ingredients with a stainless steel shaft and blades. Plus, the 15 adjustable speeds offer you blending flexibility with easy trigger control operation. Can you imagine a shake ingredient that you could not handle with 15 speeds? A trigger-like control grip sets your hand in a natural position which offers less tiring blending plus greater stability and control. And, the innovative bell shape of this immersion blender reduces suction giving you more efficient blending. Plus, the 15 variable speeds of this unit allow you to dictate the texture of your shake. This level of speed control also decreases splatters. The eight-inch shaft of the Breville accommodates most of your blending needs from single serving shakes to deeper pots. And, a non-scratch base guards your cups, bowls and pots from scratches. The accompanying whisk, chopping bowl and blending jug along with the blending shaft of this unit are dishwasher safe for quick cleanup. And, as with other brands, the motor handle simply requires a wipe with a damp sponge. Cuisinart is a well known home kitchen staple, and this smart stick is a good example of the kind of quality and convenience of the brand. Well designed, mixes well and easy to use. The 200-watt motor of the Smart Stick handles basic blending tasks such as creating your favorite protein shake. Typically, easy to blend ingredients such as liquids, powders and batter-like substances work best. For vegetable smoothies, you might want to use a traditional blender. With two speeds, this hand blender gives you control over the blending and the consistency of your finished shake. Also, holding the high or low button down offers continuous blending while rhythmically releasing the button provides a pulse feature for precise mixing. While the Smart Stick comes with a two-cup mixing beaker for quick drink blending, the design reaches easily into pots, pitchers and bowls. This versatility in blending options all around the kitchen gives you control. Plus, the one-touch feature allows you to operate the blender with one hand comfortably. And, this convenience leaves you free to add ingredients (or complete other tasks) with the other hand. Ergonomically designed, the Stick allows for comfortable handling with more control. The stainless steel blade and guard snap easily into the handles and protect your fingers from accidents that might arise when you are moving quickly. Plus, the included beaker or container offers you the convenience of transferring recipes to and from the microwave. Drip-free pouring and an easy grip prevent spills which frustrate busy mornings. Both the blending shaft and beaker are dishwasher-safe which makes cleanup simple and quick. In other words, blend, toss it in the dishwasher and go. The shaft easily detaches from the handle with the press of a button. And, the motor body itself requires only a wipe with a damp sponge to clean. KitchenAid is known as the blending and mixing king of home chefs. This 3-speed hand blender puts the reputation of their stand mixers in the palm of your hand. Three speeds give you blending flexibility with the KitchenAid Hand Blender. And, holding down the speed buttons operates the blender and leaves you in control of your shake texture outcomes. With a stainless steel S-shaped blade, the KitchenAid easily blends basic smoothie ingredients including nuts and harder cheeses. Perfect for adding almonds and chia seeds to boost a shake’s protein punch. The eight-inch blending arm of this hand blender twists to remove and lock into place easily for use in everything from deeper pots to 16-ounce cups. 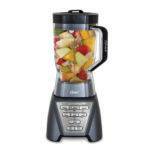 With a two-inch base span, most cups accommodate this personal blender. Plus, a whip attachment offers you versatility in mixing to your consistency preferences. And, a non slip, soft grip handle allows for longer comfortable blending when making shakes for the whole family. Two BPA-free containers (a 2.5-cup and 3-cup size) offer quick gotta-get-out-the-door blending. Plus, the lids offer spill-proof travel or storage for a healthy protein snack later. The accompanying containers and whisk attachment of this product toss into the dishwasher for easy cleaning. And, for added convenience, the blending arm detaches easily and proves dishwasher safe as well. Wiping the handle with a damp dishcloth is the only care required by this one non dishwasher safe component. And, cumbersome storage issues are diverted with this slim stick. The experience of verified review users is always worth consideration. After all, whether a product works in the real time or not is the true test. Often rated with four and five stars, customers feel the Cuisinart Smart Stick offered plenty of power and was hefty but not heavy. However, some buyers question its durability. 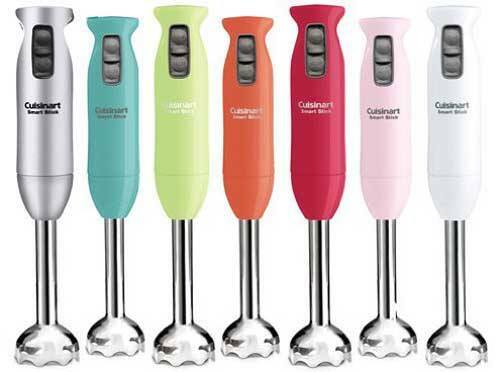 In short, KitchenAid users found the hand blender to be heavy when blending for longer periods and stated that it bogged down with thicker consistencies. While there was also some question as to its quality when compared to other KitchenAid products, a high percentage of customers consistently rate this blender at five stars, preferring it over Cuisinart. The unique, more expensive Breville blender was liked for its speed and power plus its splash-less function. Many users thought this product worked best with liquid based recipes but fared well with vegetables and ice. Unfortunately, a hand (immersion) blender may bog down when adding hearty elements. And, frustrating experiences short-change your quest to meet your health goals. There is no need to get derailed. Several blenders accommodate harder to blend ingredients with ease. Some protein shake recipes include tougher ingredients such as fibrous celery or beet. Or, you may simply enjoy a chilled drink and choose to add ice cubes. Immersion blenders will not do a great job at these tougher ingredients, but the three blenders below are the perfect solution. Blend until smooth in your choice of blender and drink up! Again, consider a brief list of pros and cons when looking to purchase a heftier blender. 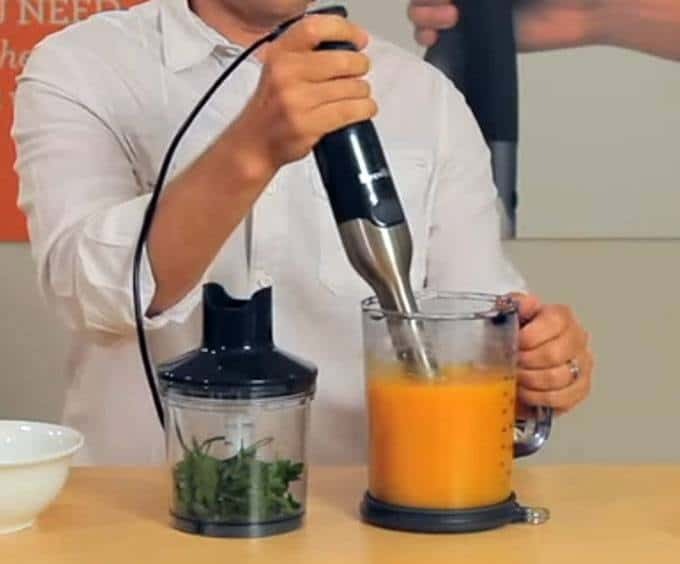 In this section we review the blenders that you can use for personal shakes incorporating tougher ingredients like ice and vegetables. We chose the best models according to our experience as well as based on our research of user reviews. The Jamba Juice Company is known for its dedication to healthy, active lifestyles with products to bring convenience and blending to your home. The Jamba Appliances Quiet Shield Blender created in conjunction with Hamilton Beach makes good on this legacy. 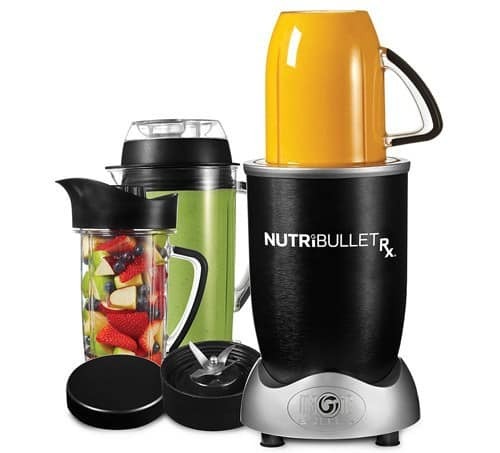 The 1.6 horsepower of the durable metal drive and stainless steel blade of the Jamba handle ice cubes plus coarse fruits, vegetables and nuts. In other words, this blender proves up to the challenge of any ingredient you add to your shake. Infinite speed control through a dial gives you blending and texture control. And, a pulse feature offers even greater precision. The infinite speed dial control proves intuitive and easy to use. However, without presets or timers, this blending option requires you to stay close by. The bonus feature of the Jamba is the accompanying quiet shield which does as it promises. A blending experience quieter than other brands results, even quiet enough to hold a conversation. Two BPA-free, shatterproof containers offer mixing size choice. While the 32-ounce offers measurement markings, the 20-ounce with a flip-top lid brings you the convenience of blend-and-go beverages. All removable parts of this blender can be thrown into the dishwasher for quick cleanup. Or, add a few drops of dish soap to the blender jar, fill halfway with water, blend 30 seconds and you are done. NutriBullet offers state of the art blending using their patented extraction methods. We like the convenience of using this appliance, and if you want your shakes and smoothies to pack significant nutritional punch, this is the blender to go for. We've recently researched this machine in-depth, so be sure to check out our full review on the NutriBullet Rx. 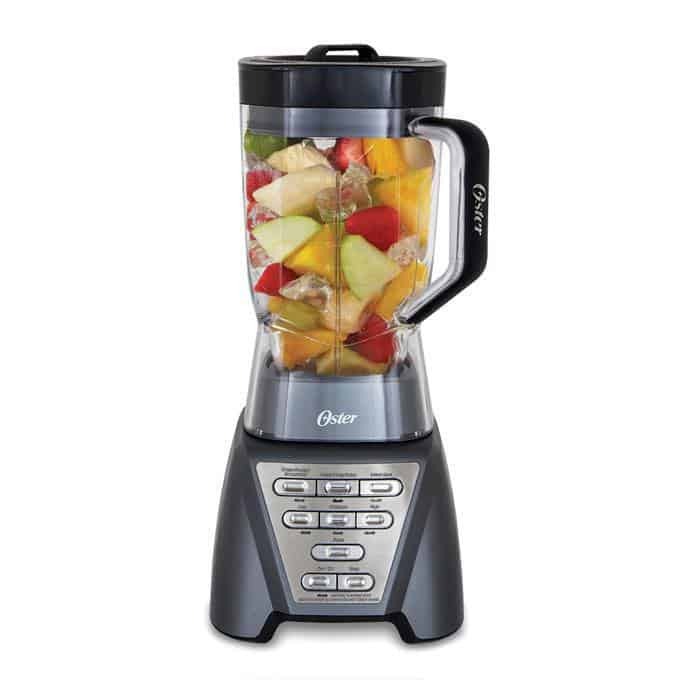 Oster blenders have brought power, speed and delicious meals to kitchens for years. This legend among blending companies offers a modern twist in the Pro 1200 as it jumps on board the smoothie and protein shake craze. Dual Direction Blade Technology including extra wide 3.5-inch blades offer you boosted blending power ensuring foods reach the blades for smoother shakes. And, the 1200 power watts which handle tougher ingredients are joined with an added 900-watts specifically designed to crush ice. The Smart Settings Technology of the Oster brings seven speeds into your kitchen to meet your shake texture preferences. And, three pre-programmed settings make for quick, thought-free blending experiences to keep you moving on those busy mornings. The power and pre-programmed settings of the Oster make quick work of consistently delicious protein beverages. It frees you to walk away from the blender. Plus, a pulse feature gives you added blending control and precision. A six-cup Boroclass glass jar proves useful for larger batches but less so for single servings. However, the included 24-ounce smoothie cup answers your needs by allowing you to blend directly in the cup and go. The All-Metal Drive of Oster products such as this one ensure years of uninterrupted blending. And, this durability guarantees that you have the opportunity to keep up with your healthy eating plans. The Boroclass glass jar and cup are dishwasher safe which speeds up cleaning. And, the blender fits nicely under the counter for quick storage. 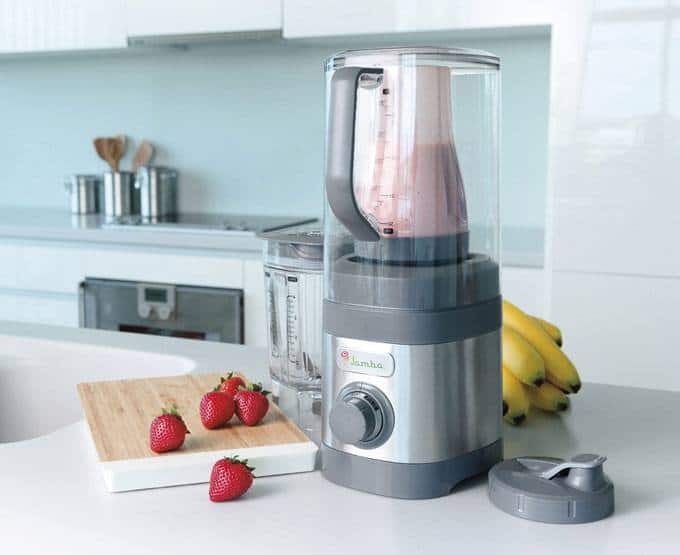 The Jamba consistently receives five-star ratings with buyers praising its quietness and power. While the included sound enclosure proves a bit inconvenient, it gets the job done. While users find the NutriBullet loud, they praise its durability and ability to make smooth, delicious shakes. A problem with gasket seems an issue for some customers, but others found an easy fix by following the manufacturer’s instructions when removing the blade housing. Oster offers a product which easily blends coarse ingredients including ice and seeds according to customers. With four and five star ratings common, some buyers are pleased with this blender over the more expensive NutriBullet Rx. Choosing between a personal blender and a heftier version which handles ice and other tough ingredients well, requires you to know your habits and preferences. What ingredients will I include in my protein shake? Will they be primarily soft foods like yogurt and chopped mango? Or, will I use nuts, ice or fibrous vegetables like kale? Do I intend to make mostly personal-sized batches? Or, will I use the blender for other larger batch items? 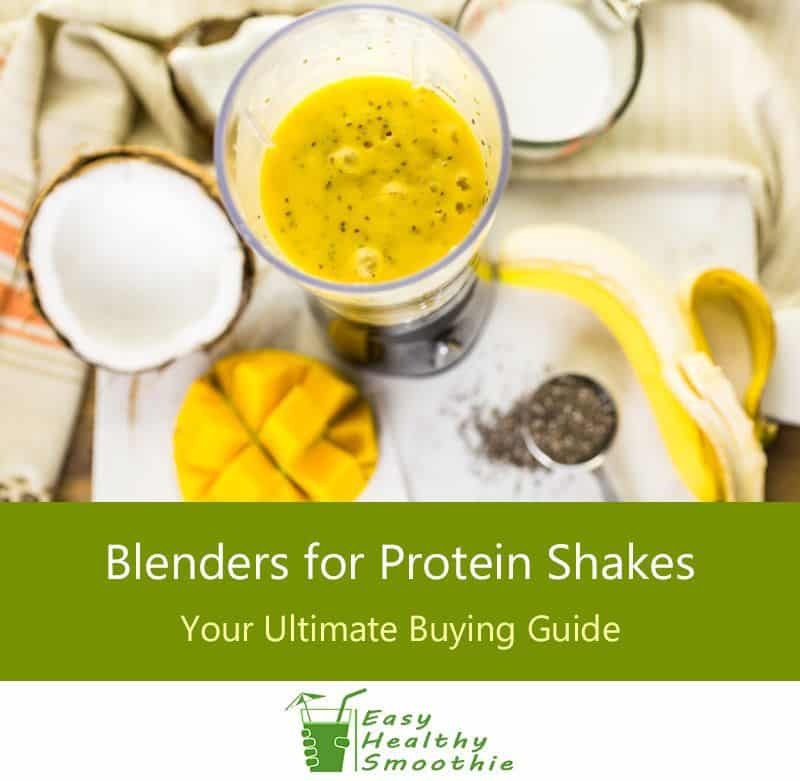 Using our guide above with these three questions in mind, will help you quickly zoom in on the blender model that’s perfect for your protein shakes. The above top picks offer quality solutions no matter your answer. So, do a bit of soul searching and grab your top pick from the products above to get started on your health, fitness and weight goals with a protein shake. What do you think? Comment below on your experience with any of these personal blenders. Blending up healthy protein shakes at home proves quick and easy with the help of the right blender. Check out our ultimate review of personal blenders and those which handle ice to choose the one that’s perfect for your fitness goals! Great post! I’ve started making more protein shakes lately for after my workouts and I was wondering what the best type of blender would be. Thanks! So glad we could help you out, Alex!